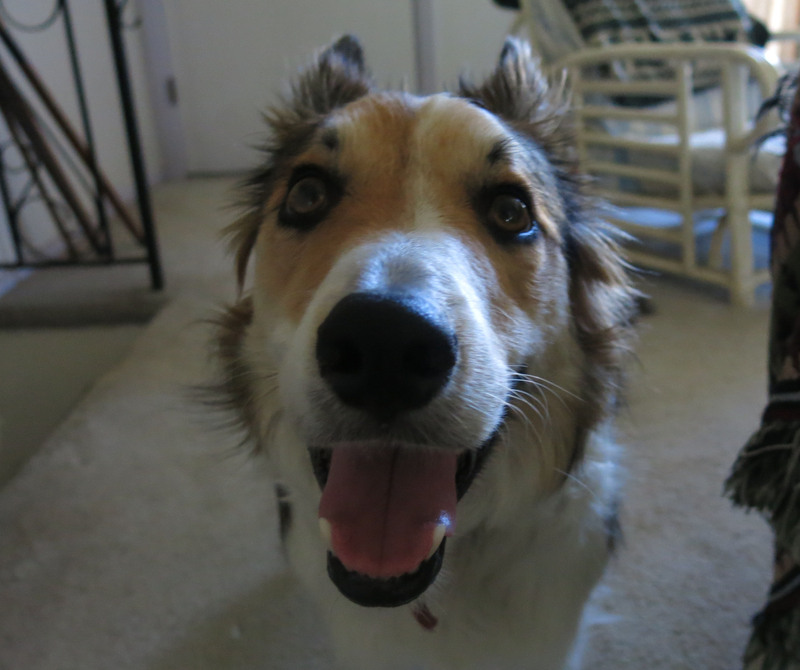 Greetings and salutations, everyone; yes, once again it is I, Mani the purebred border collie, filling in for the guy I live with (which is pretty strange, since I didn’t even go to Oregon), and here to bring you some more pictures. You may remember me from such posts as “We-Are-From-France”, among so many, many others. Here I am in a characteristic pose. Not hugely in focus, of course. I suppose not being in focus is like a metaphor, or something. Not for me, of course. 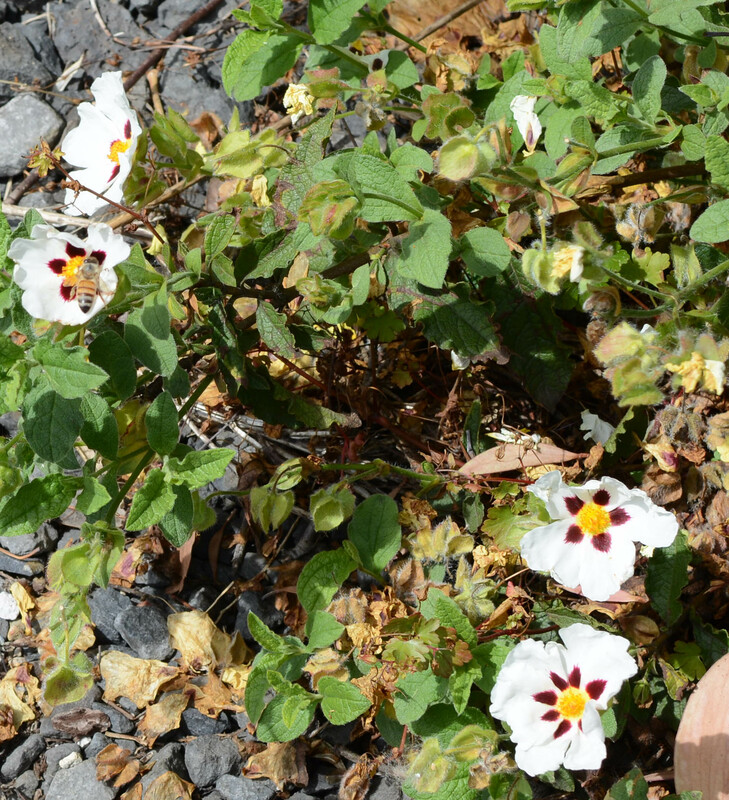 This is a picture of a cistus, taken at Joy Creek Nursery, where most of the pictures didn’t come out as well as he would have liked. He’s ordered from them for years, so maybe he’ll be forgiven. It is a clever way to introduced the pictures for today, don’t you think? 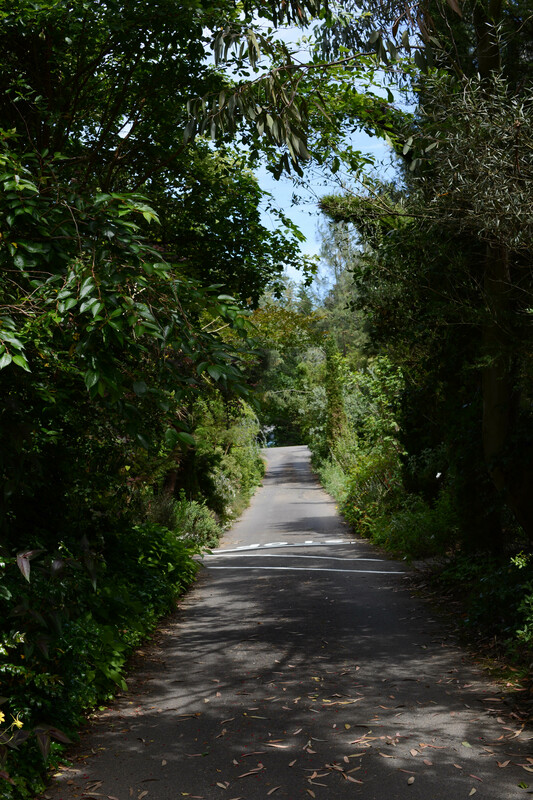 This is the driveway at Cistus Nursery. 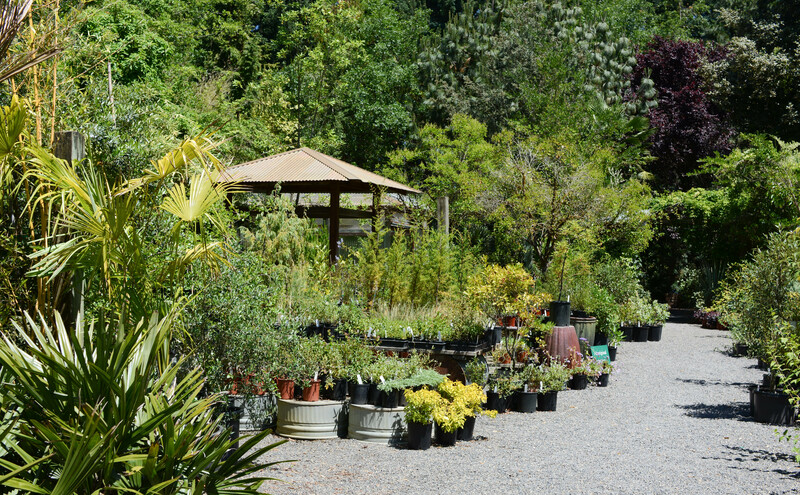 The nursery is on an island in the middle of the Columbia River. A big, flat, green island with a lot of plant nurseries. 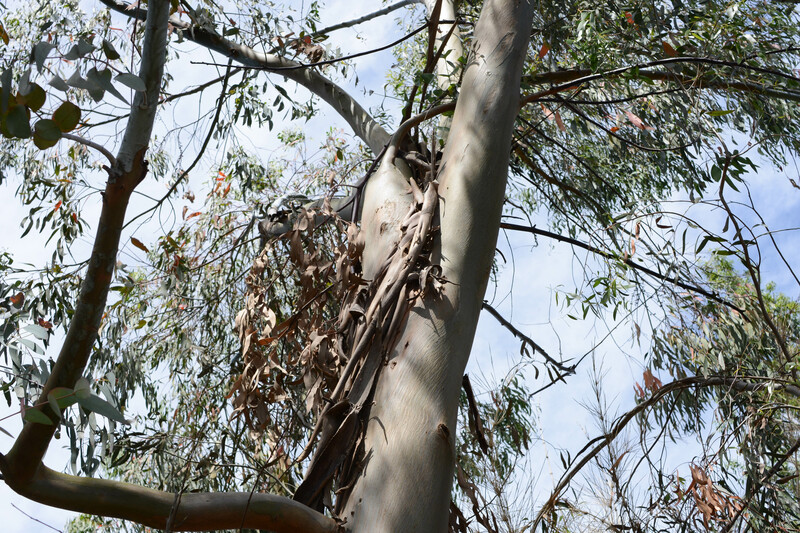 The eucalyptus should have been a clue. 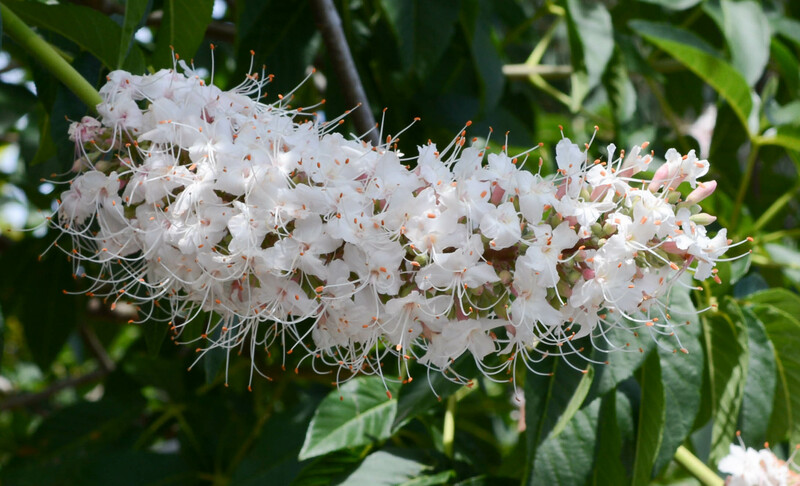 And the California buckeye, again. 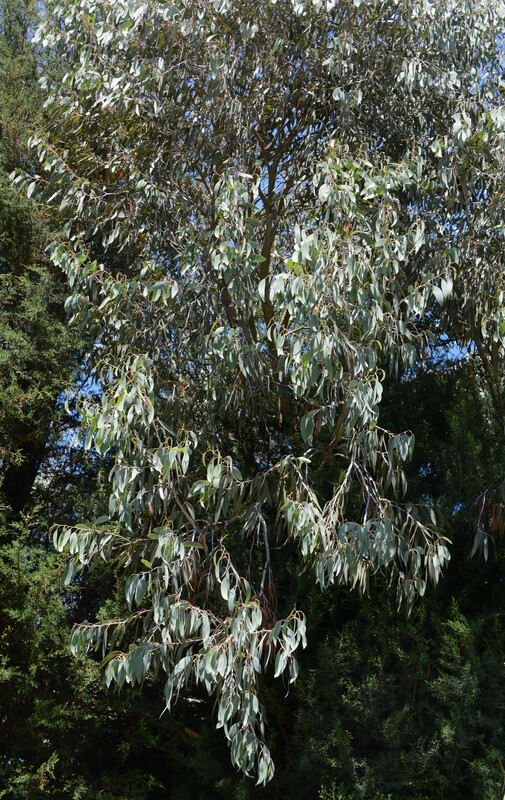 Manzanitas. 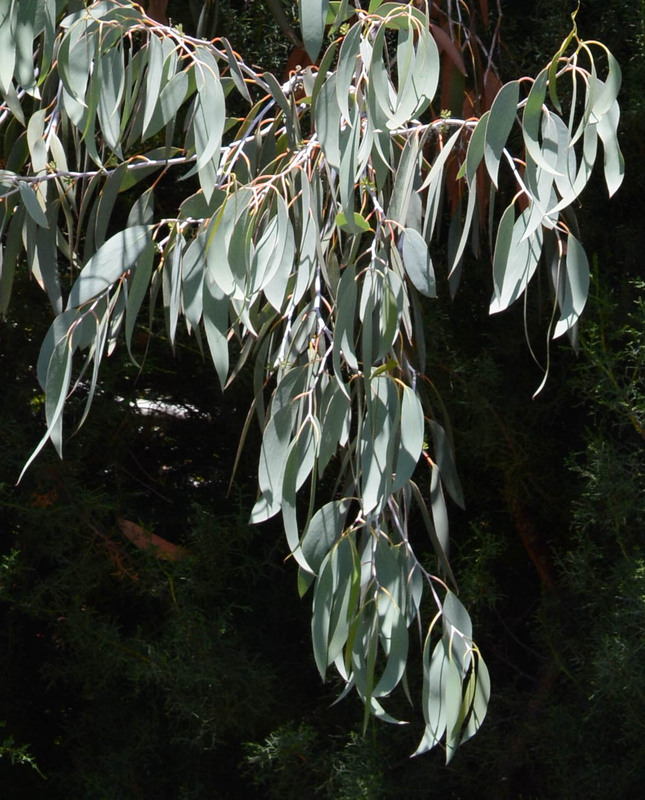 These particular ones are “hopeless” here, though we do have manzanitas in the front yard. A ceanothus, again. There were a lot of them in the nursery. The guy I live with said he wanted them all, but that none would grow here. 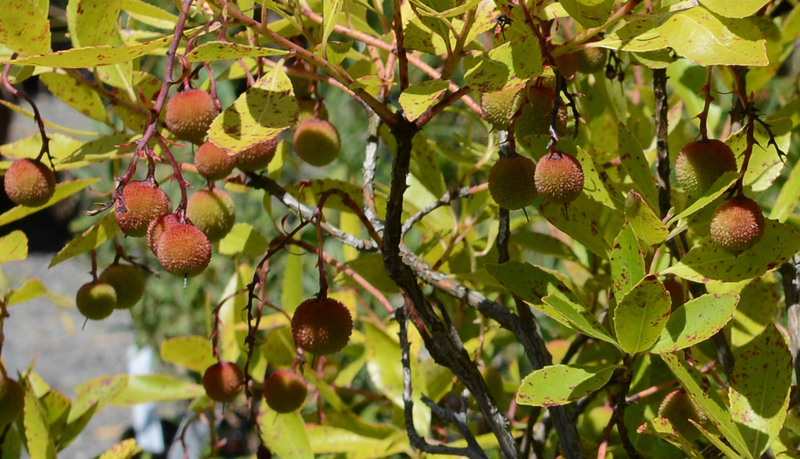 The “Killarney strawberry tree”, Arbutus unedo. It has flowers (not yet, though) and fruit at the same time. 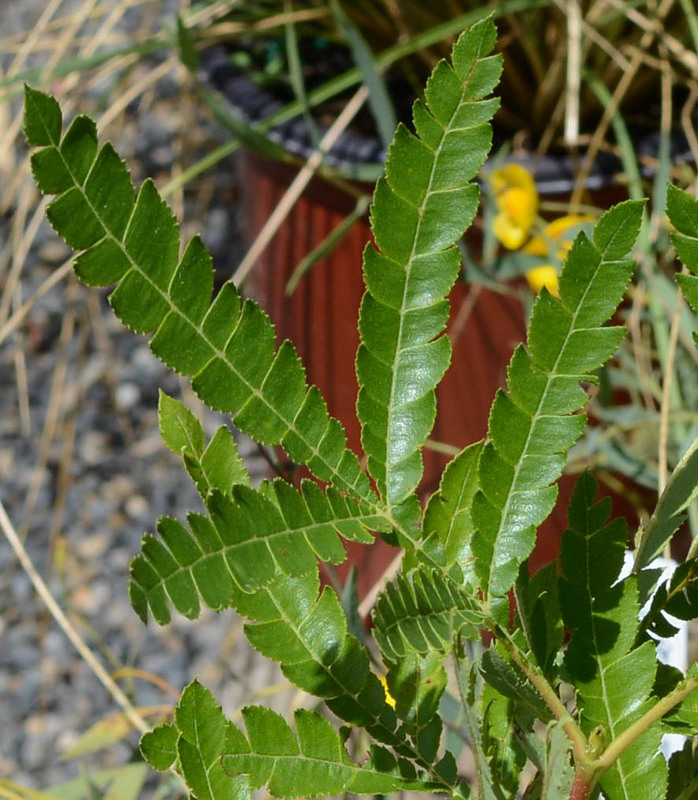 Leaves of Catalina ironwood, Lyonothamnus floribundus. The guy I live with always heard about Catalina when he was growing up, and the glass-bottomed boat, which sounds very scary, but he never went there. That’s all the pictures. The guy I live with said he was so overwhelmed by the nursery that he forgot to take a lot of individual plant pictures. “Maybe next time”, he said. He did get a couple of oaks, which are being shipped here. There really hasn’t been much going on here today, because it’s been too hot for me. Right now it’s eighty-six degrees Fahrenheit (thirty Celsius) and fifteen percent humidity. “A bit muggy” he said, which I know is an exaggeration. I hope you enjoyed the pictures. I think they would have all been better with me in them, but, whatever, huh. When it’s this hot, here’s what I do. These are very soft Pottery Barn sheets, and even though I know they’re not the most expensive ones, I really do like them. Thank you for sharing photos of the nursery, Mani, a generous act since you are in none of them and weren’t even there. Looks from the evidence the guy you live with and his friend enjoyed excellent weather. You must share photos of the oaks when they arrive, of course. Catalina has an excellent native garden, the Wrigley, set longitudinally in a canyon. You walk uphill along one flank until you reach a high view spot with a fountain decorated with coveted Catalina tile. After admiring the town, cove and ocean, you walk back on the other flank of the canyon trail. Then you try to find a purveyor of ice cream. I love your last portrait. Makes me want to lapse into a nap. Stay cool. Thanks. The weather was excellent. The guy I live with talked about the way Portland smelled. He said it was enchanting. It was more humid than here, and scent carries better in moister air. Downtown didn’t smell like diesel and hot asphalt (he said the latter was an okay smell). 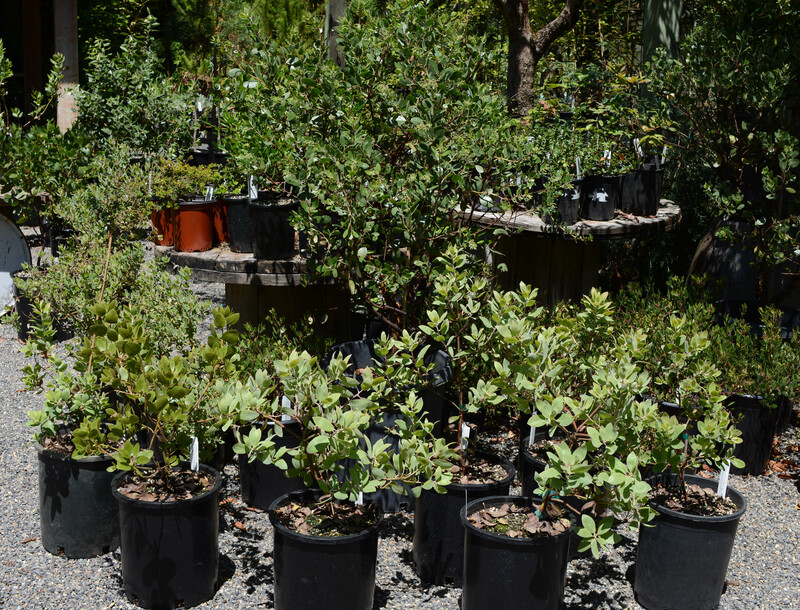 He said if he ever went to Catalina it would be to see if he could look at the stand of Cercocarpus traskiae, because there are lots of cercocarpuses (mountain mahogany) here. And for ice cream. The Pottery Barn sheets are excellent. Someone, don’t ask me who, chewed one of them, but they’re still very soft. is the guy you live with thinking of moving to the Northwest? No, we’re not moving. The guy I live with is just moping, that’s all. But I hear it was beautiful there. 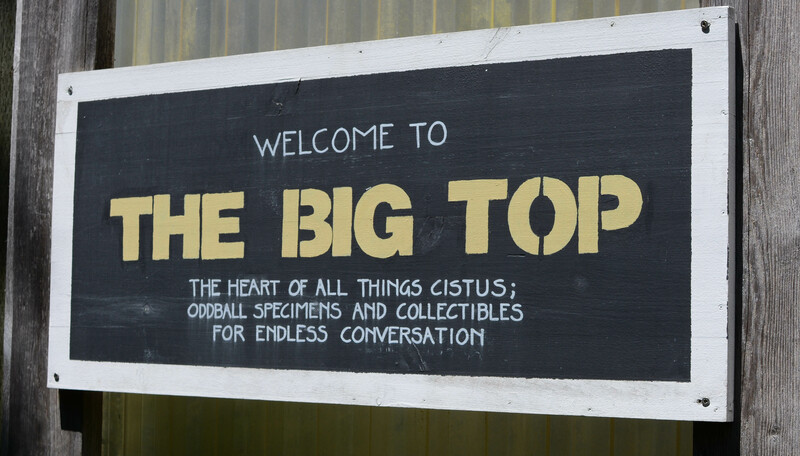 Living near Tacoma, I go to Cistus at least once a year, sometimes twice. It seems so odd to see photos of it on your blog. I love it, it’s a great nursery. I hope we’ll see more photos of your Portland visit, maybe of at least one private garden that I know you visited while you were here in the PNW. Funny, huh. 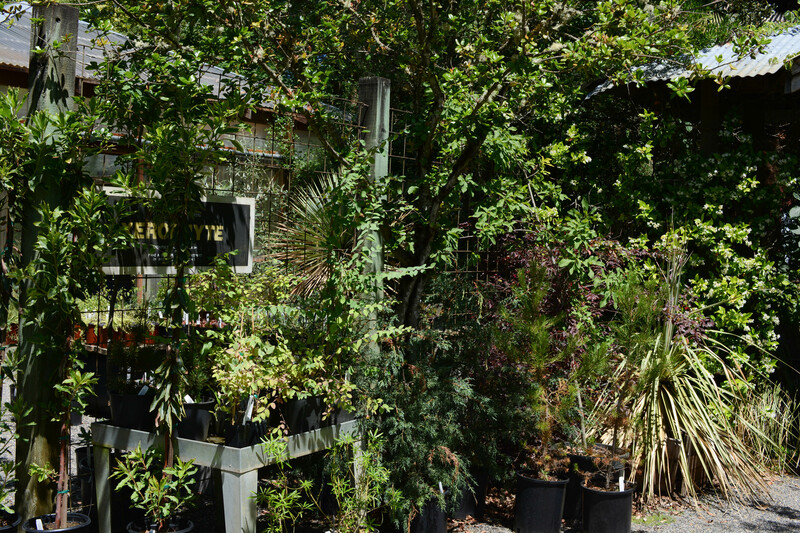 The guy I live with said that if we lived there, I would have to get a job in order to help pay for the zillion plants he bought. Purebred border collies here sometimes get jobs chasing geese off of golf courses in the winter, and that sounds like a lot of fun to me. The only other pictures are of two private gardens. The guy I live with said some of the pictures didn’t turn out because of some mysterious thing called “ISO”, which he hasn’t mastered yet (if he ever will), but that maybe they’ll be posted soon. I have often wondered something and maybe TGYLW can now offer some insight. Portland seems to be a place where you can successfully grow just about anything with the possible exception of pointy dryland plants. And that’s what a lot of people up there want! Why is that? I guess you just want what you want but it still seems strange to me. 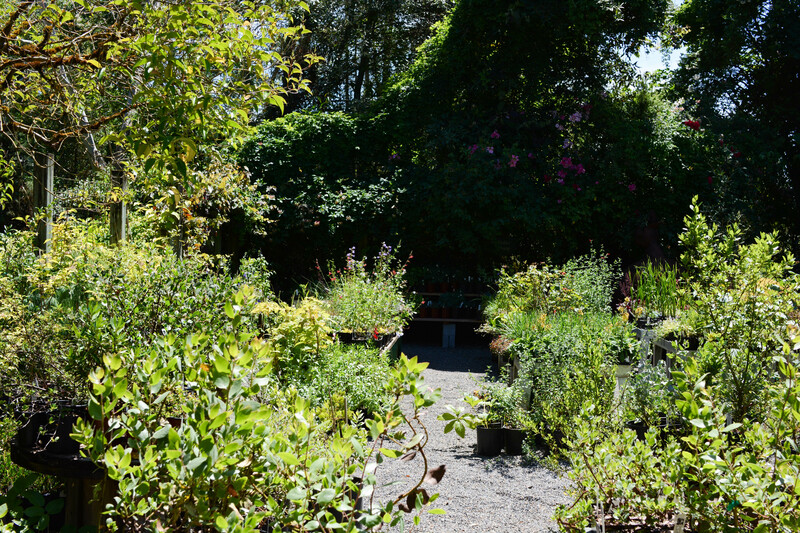 But plants aside – what are the charms of Portland anyway when Mani waits at home? Well, the people at the place where I stayed, which is also Day Care and my doctor’s office (all in one) said I mostly splashed in the pool when I was on vacation. I had a pretty good time. 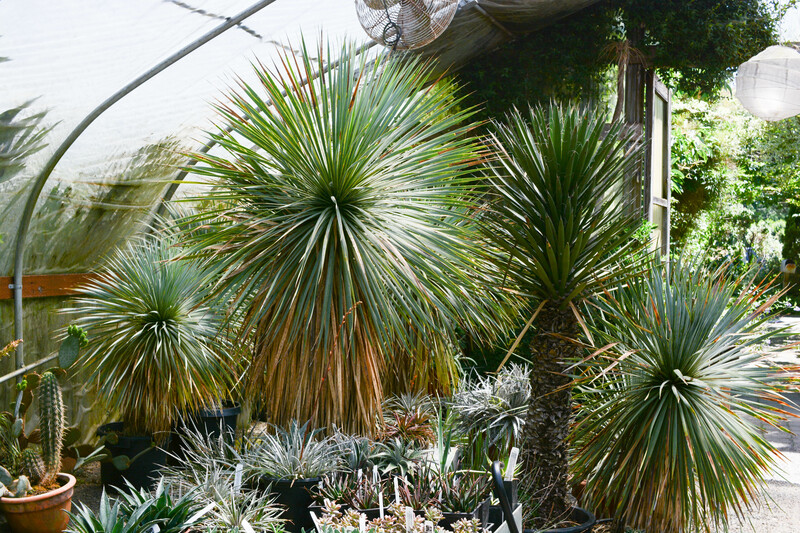 It turns out they can grow a lot of pointy plants in Oregon. Maybe more than we can here. Ironic, I know. 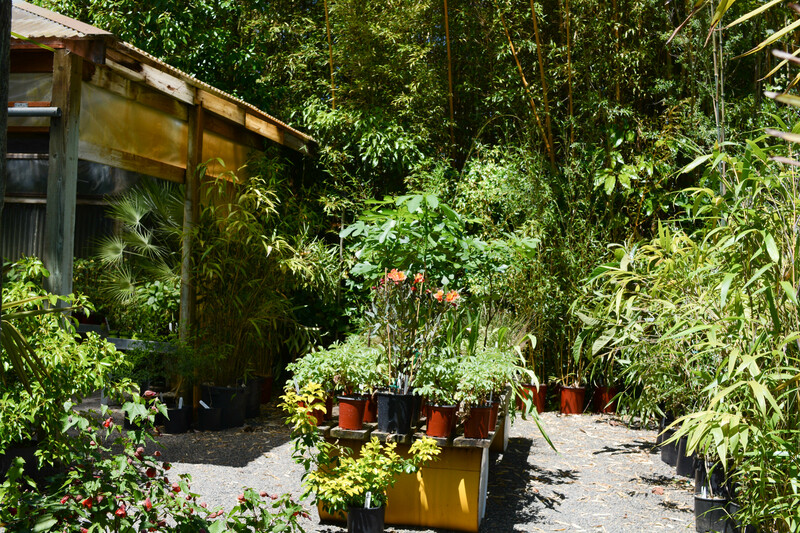 The plants can take rainy winters if the temperatures don’t get too low; most of them come from climates that have rain in the winter, but not a lot of cold. Not like we get here. 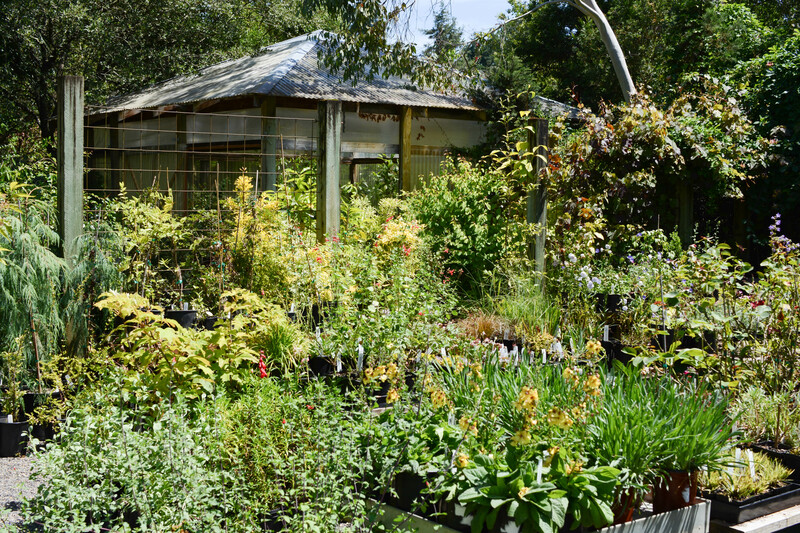 Why gardeners want to grow plants other than those suited to their conditions is an interesting question. Most gardeners here grow plants definitely not suited to our conditions. The guy I live with, who tries not to be snarky, would say that any plant which needs supplemental watering here, after it’s been established, is not suited to the climate. But that’s what everyone wants. 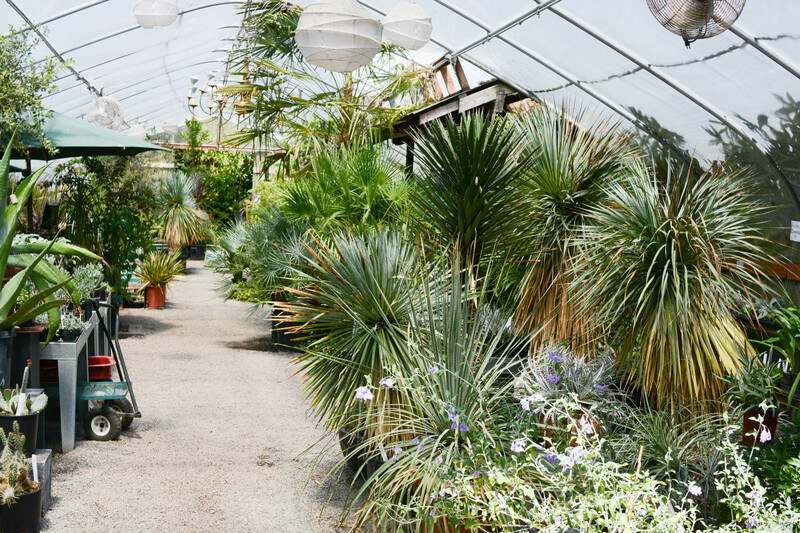 He says that if we lived in California, on a large estate, say, there would be no plants which needed watering at any time, after they became established. 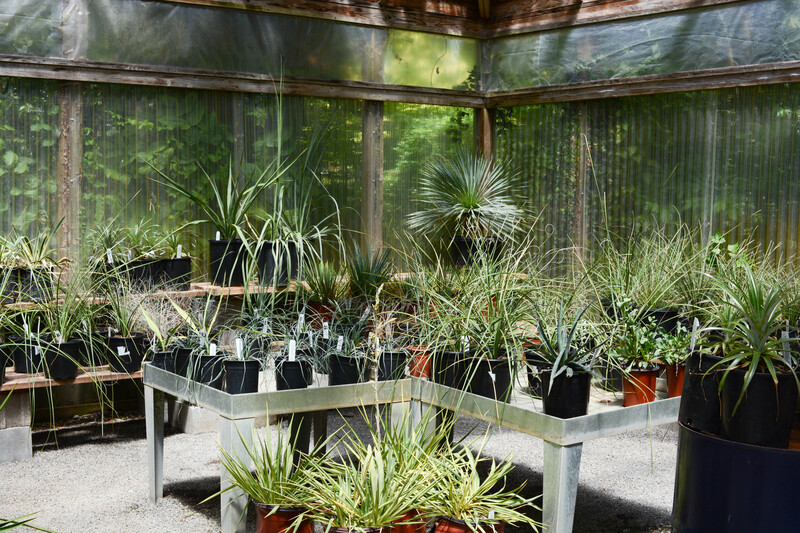 The number of plants adapted to that climate is astronomical. And each one prettier than the next. Everything here is suited to them almost all year but a few days in winter would kill them all. Sigh. Maybe. You never know until you try. Well, the guy I live with has tried ceanothus. He says that if they can take cold, it’s just for a night or two, and not very much cold at that. The one called ‘Gloire de Versailles’ died very quickly here, even though it’s supposed to be hardy to Zone 6. The Californians are Zone 8 maybe, mostly Zone 9. Winter rain, no summer rain. 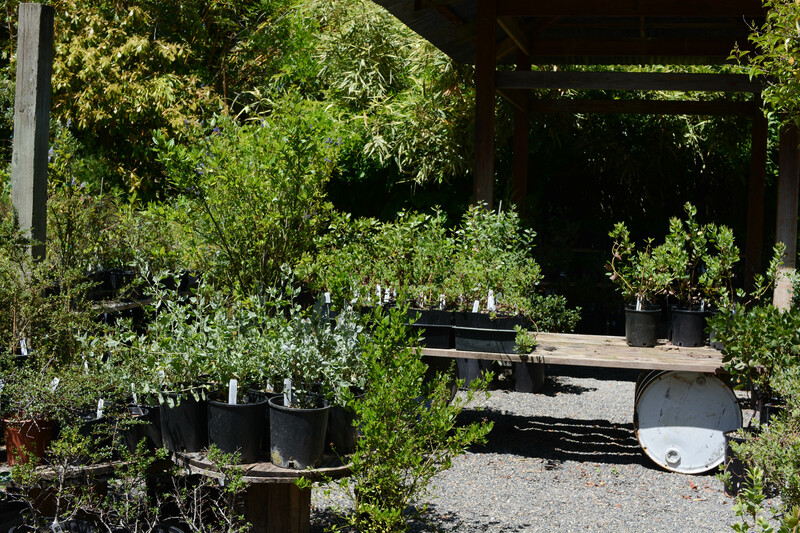 There are native ceanothus; we have two plants of C. greggii, but they’re white-flowered. (There is a blue one but it’s a rare variety, franklinii.) When the guy I live with and his friend were in Steamboat Springs last year, he saw huge swathes of C. velutinus, but that apparently needs to be under fifteen feet of snow to endure the cold that places like Steamboat get. It doesn’t survive here at all. Dear Mani, this is a very brief reaction..to just re-encountering you! I happen to be a human, and a female human, but was so close to MY Border collie, that I get drawn in to really thinking of you as having a will to communicate! He, you see, so loved me talking with him and pointing out things to be looking at, that I just got this sense that Border collies are extraordinarily intelligent and open to articulation! 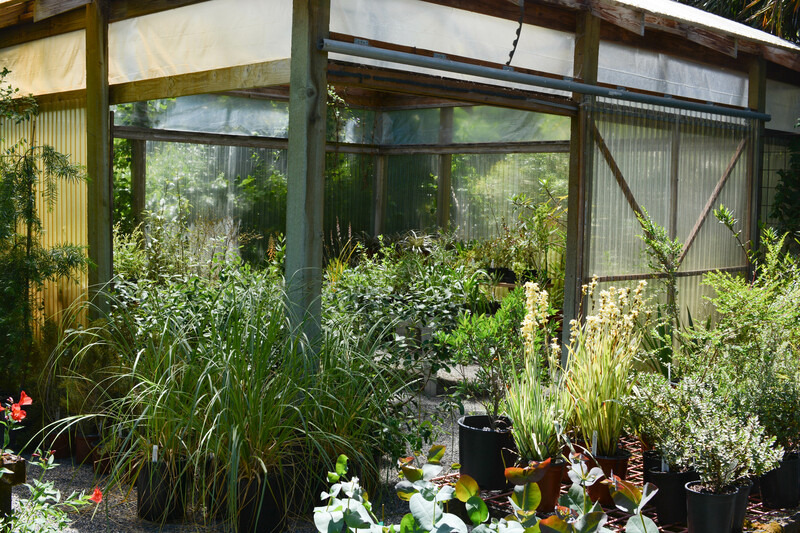 My interest in alpines, rock gardens, cushion plants, Joy Creek Nursery (I ordered much from too), Arrowhead Alpines, Mt. 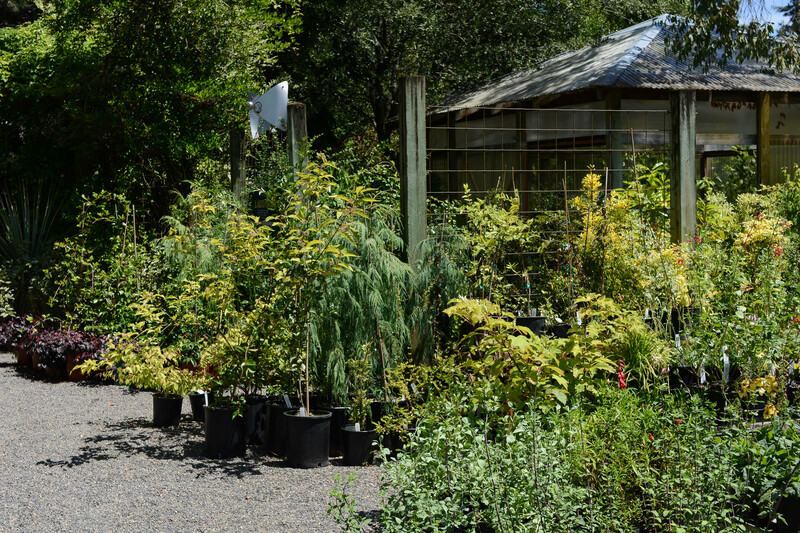 Tahoma Nursery, Siskiyou Rare Plant Nursery, etc etc…unto England and Czechoslovakian growings I imported…..is sort of separate to the Border collie one. I, when he was alive (he born in 1988), still thought animals had minds in their brains and simply not the ability to break up sounds into articulate variables to the extent of human language. Thus I thought then the complete consciousness was there, existing, in such as you but could not sputter forth floweringly articulate. 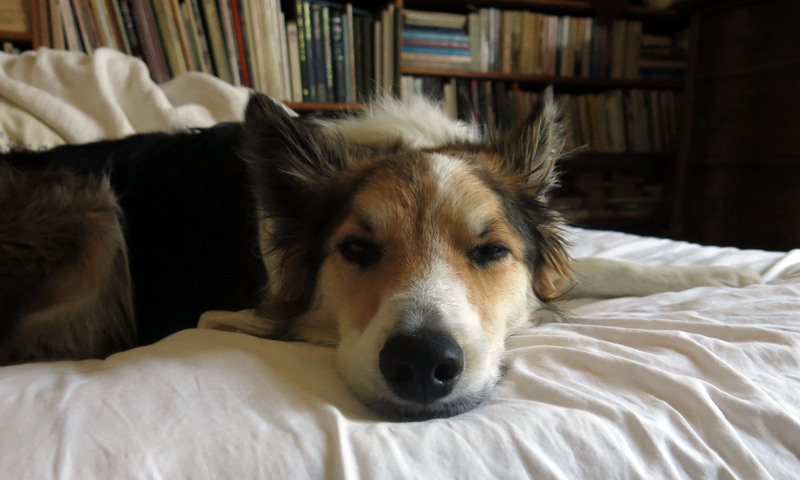 It probably did not happen to you, but my Border collie named Brimo (meaning Dusk in ancient Greek) took being hit, rolling under the wheels and getting much crushed, twice, by a car and a truck, to stop thinking wheels in speed were not sheep needing to be herded. His dire condition each time near death, made me extremely close I think, or else he became feeling very close to me. So, in short, I imagine you are conveying a happiness you do have of sorts, with your master! Much love to you on this earthtime experience. Thanks. The guy I live with ordered from all those places, too, mostly back in the last century. Yes, it does rather seem to be of the last century, in my case also. The first named observation was visiting my oldest sister at her college in Claremont, CA, and touring the Claremont Botanical Garden. That also was where I became so attracted to drifts of Heucheras under the Planus trees. But as my only brother killed himself at 18, close to her in age, I started being drawn to cloud effects as to human made gardens, plus the real illusions of in nature made landscape. In California where we did not bump into Gentiana, the blue of Ceonothuses (plus white of) was just so fitting for thinking back upon humans once alive, then dead. 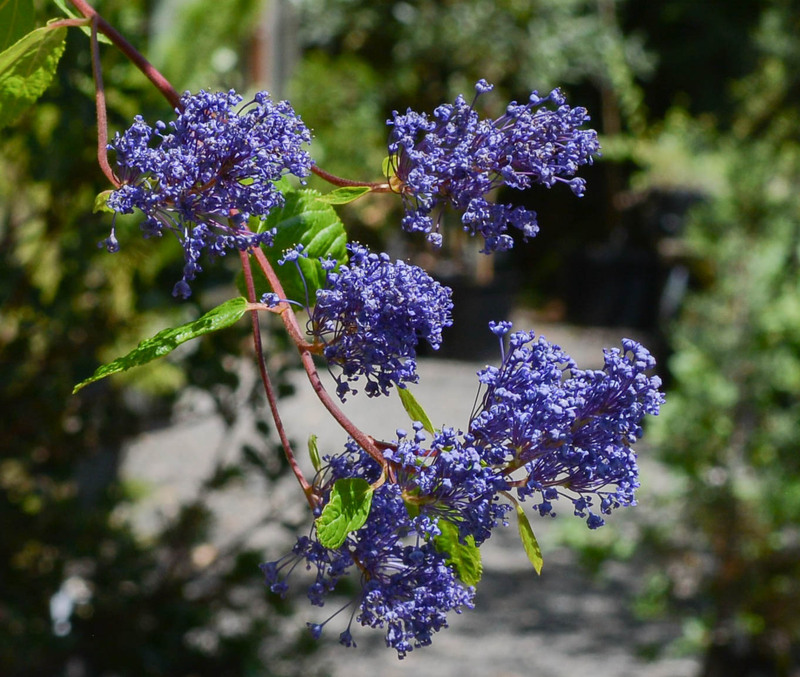 My parents and I just loved Ceonothus (when I was a child) and it ended up being bought and grown as to many subspecies. But then I was brought up in southern California. I could have a garden of only it, I find it so attractive. The guy I live with grew up in Long Beach. No one grew ceanothuses in the neighborhood he grew up in, just mostly hybrid tea roses and things like that.